Infinity pools, luring tourists to exotic destinations with the promise of limitless luxury and breathtaking views unbounded by the jumble and clutter of everyday living. Travel Brochures and blogs feature them prominently, and sell the idea of the ultimate experience of boundless freedom. Sometimes when I look at one of those photos, the idea of a no boundaries, a limitless horizon, feels uncomfortable and even a little scary; I am not sure if I am ready to swim into the distance or step into the unknown; I am comfortable with what I know, where I am going, the route I have chosen. I am comfortable, but could there be more? Am I truly content with where I am at the moment, are my known boundaries a barrier to moving forward? And if my boundaries limit me, how do I break them down and venture into new territories? This infinity pool is an illusion, however. I know that if I view it from another angle there is no endless horizon and I can see the mechanism which allows the pool to function, and the water to recycle back into the pool, which is exactly the same as every other swimming pool. 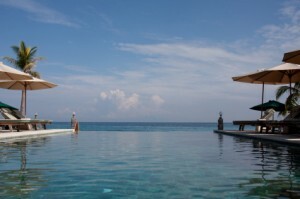 The water in the infinity pool is trapped in a closed system, an endlessly repeating cycle. The water in the pool can do nothing about the system which it finds itself in, but I can. If I view my situation from another angle, I can see the systems which are holding me in place. When I identify the different ideas which keep me there I can separate my core values from old and limiting beliefs, I begin to know my boundaries. Of course, this is not something I do every day, there are periods in my life where the water in the infinity pool feels just fine, and I have no need to change. But sometimes, when the cycle I am in begins to feel uncomfortable, when I know I could do things much better, I need to I identify where I have set my boundaries, I need to let each limiting belief go, discard those thoughts and let myself move forward. Sometimes I can do this alone, at other times I ask for help from someone else. There is one thing for sure, whenever I take this step, I get the courage to move out of the infinity pool and start swimming in the open sea beyond! If you want to swim in the ocean but are not sure how to step out of the pool and contact me. This sige was… how do I say it? Relevant!! Finally I have found sometbing thatt helped me.